Kristina: I co-founded a publishing company, Blank Slate Press, in 2010 and we’ve published 6 books—5 fiction and one memoir. I am also a partner in Treehouse Publishing Group, an author services company that works with both traditionally and self-published authors. For my own work, I queried and had some interest in my historical fiction, ORACLES OF DELPHI, and have one traditional publisher that would like to see a revised version. But because of my experience with Blank Slate Press and Treehouse, I asked myself why I should have someone else publish my book when I can do it myself. 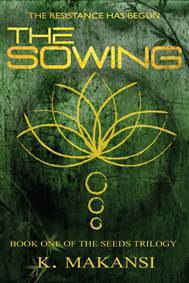 So when my daughters and I co-wrote THE SOWING, the first book in our YA/New Adult sci-fi trilogy, we decided to publish it ourselves. We are a family of do-it-yourselfers and self-employed types, and the lessons learned from each project I’ve worked on over the years for other authors—from editor to title consultant to interior layout designer to cover designer to event coordinator to chief cook and bottle washer—can all be applied to publishing and marketing THE SOWING. So self-publishing makes sense for us. Kristina: We love social media, of course, but we also love meeting readers face-to-face. I have wonderful relationships with the local independent booksellers and enjoy working with them to host author events. You may not always sell a gazillion copies, but you always have a good time. And as much as independent authors depend upon Amazon and online e-books, I believe in supporting other small business owners as well. Attending conferences and meeting other authors—who are usually voracious readers—is important, too. Kristina: Building an audience as an author is difficult whether you’re traditionally or self-published, but I think Facebook and even LinkedIn are good places to connect with other authors. There are all sorts of genre-specific groups to join on those sites. A lot of people are using Google + as well, but I’m not nearly as active there. As far as blogs/websites go, I subscribe to Publishers Marketplace, Publishers Weekly, and the The Shatzkin Files, and I read Publishing Perspectives, Jane Friedman’s Writing on the Ether, and David Gaughran’s Let’s Get Visible religiously. I’m also a member of the Alliance of Independent Authors. Kristina: Getting readers to buy our book, of course! Seriously, it is tough out there for debut authors whether you go the traditional route or the independent route. And just because you have a publisher—even a big five publisher—behind you, it’s still tough. The biggest challenge is marketing your book without being annoying. The number of people on twitter who simply tweet “Buy my book!” all day long makes my head hurt. Kristina: Be professional. If you want to be considered a professional author, if you want people to shell out their hard-earned money for your book and then precious time out of their busy lives actually reading it and then recommending it to others, you need to approach the writing, the editing, the interior layout, the cover, the marketing and promotions just like you would if you were opening a shop down the street. As we say at Treehouse, writing is an art, but publishing is a business. And running a business takes investments in both time and money. Hire an editor. Even if you’re planning to query and hoping to get an agent or editor to publish traditionally, you should hire an editor to get your manuscript in the best shape possible. Agents and small press editors get hundreds if not thousands of queries, and if your work doesn’t stand out, you won’t have a chance. If you’re self-publishing, hire a proofreader. Hire a cover designer. Be professional. If we all, as independent authors approach publishing professionally, the old stigma around self-publishing will disappear. Kristy co-founded Blank Slate Press in 2010 to discover, nurture, publish and promote new voices from the greater Saint Louis area and beyond, and in 2013, she co-founded Treehouse Publishing Group to provide author services to both traditionally and self-published authors. She has worked as a copywriter, marketing coordinator, web and collateral designer, and editor. She has a B.A. in Government from University of Texas at Austin and a M.A.T. from the College of New Jersey and an opinion on everything. Currently, she is hard at work revising her historical fiction, ORACLES OF DELPHI, set in ancient Greece and is publishing THE SOWING, the first book in THE SEEDS TRILOGY, a YA/New Adult sci-fi series co-written with her two daughters. Great interview with some fascinating information. I will have to read it a couple of more times to make sure I don’t anything. Thank you. Great insight re; all questions/answers, but I thought the point made about professionalism on the part of self-published authors was right on the mark, well stated, and in my experience, absolutely correct. We keep talking about competing with tradiionally published authors–professionalism is the key.